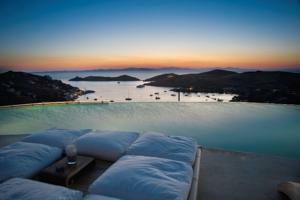 In my opinion there are really just three choices of where to stay on Kea. You can stay in the town of Ioulida. It won't be on the beach but you will get a unique Greek Island village experience and you can always take the bus, a taxi or drive to the beach. Most likely your house will have an amazing view that will make you glad you stayed there and even remind you of Santorini, and it is about as close as you can get to living in a Pueblo village. And when it is really hot in the summer it is cooler in Ioulida. You can stay in Korissia which is the port and as ports can be, it is a little busy at times. But there is a perfectly good beach there, great swimming off the rocks, and you can walk to the beach at Galiskari and the tavernas and cafe-bars at Vourkari if you grow tired of the ones in Korissia which are just as good if not better. The third choice is Otzias which really has the best hotel/apartments, two great tavernas, a long beautiful beach and though there are no shops there is a periptero (kiosk) where you can be essentials like cigarettes, gum, contraceptives, bottled water, soft-drinks and even beer. You will want a car wherever you stay but in these three places it is not totally necessary. You can take the bus, or taxis when it is not running and even walk between the three areas if you like walking. If you can find something in Koundouros within walking distance of the sea then that is OK too but chances are it won't be cheap, and you will still want to have a car or even a helicopter. As for the rest of Kea here is the situation. A lot of people built their summer/weekend retreats here on cheap land out in the middle of nowhere. Then because they had to pay tax on them, and with the crisis could barely afford to go there themselves, they have put them up for holiday rent on various web sites. These are very nice houses but without a car you will feel very isolated. With a car you may feel isolated too because you will have to get in your car just to buy a candy bar or go to a taverna. So it is important to know where your rental house is in relation to the port, Ioulida, beaches, shops and tavernas. But in most of these houses you will need a car. If you are unsure of the location of a house or want to know if you will need a car or not you can e-mail me. The Red Tractor Farm Guesthouse: Matt's Pick! 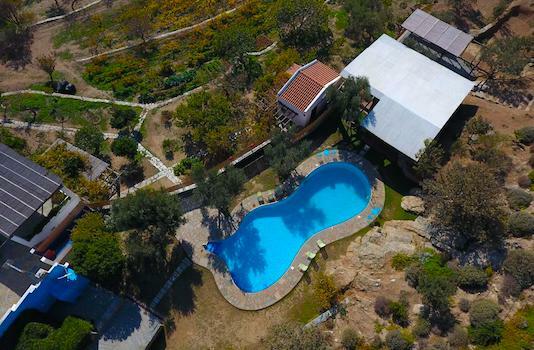 Unless they are fully booked look no further than the Red Tractor Farm, a guesthouse in the valley of Korissia just a few steps from the beach. There are three separate two-story houses, each beautifully designed for the utmost comfort and practicality of their guests. Each house has a living room upstairs with a slightly raised sleeping platform as well as a desk and access to wireless high speed Internet connection. There is a shower/w.c upstairs as well as down-stairs. Downstairs there is an additional bedroom with 2 single beds or 1 double according to your needs. All stairways are child-safe with doors and half-doors on either end. Natural light is a key feature of the design indoors as well as outdoors. There are shady seating and lounging areas on both levels as well as sunny spots for sunbathing. It is possible to rent one floor only of a guesthouse, when available. Red Tractor Farm is located at the edge of the port village of Korissia. The port beach is at the end of the road, just a two minute walk, and a second sandy beach, Gialiskari, is less than a 10 minute walk from the guesthouse. Both beaches have clear water and are very safe for children. The port of Korissia is pedestrian-only in the evening where there are tavernas, cafes, bakeries, food markets and a number of bars. 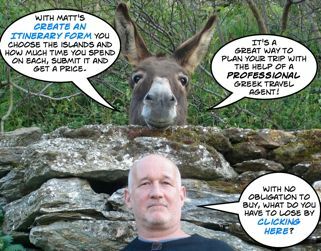 The guesthouse is run by Kostis Marulis who also does Walking Tours of Kea. Red Tractor Guesthouse is open year round. It has rated #1 on Tripadvisor and Lonely Planet for several years running. Located on the outskirts of Ioulida, Hotel Serie is a typical Cycladic complex offering rooms with a balcony overlooking the Aegean Sea and a spectacular view of the town which is a short walk from the hotel. 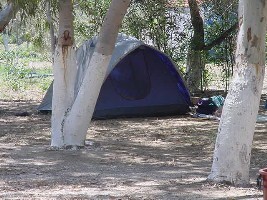 The hotel is 5.5 km away from the port of Korissia and the nearest beach. Featuring bright colours, the tasteful rooms at Serie are decorated with respect to the local style. Each has a seating area, a satellite TV and a refrigerator. All units are also fitted with bathrobes, toiletries and a hairdryer. A continental breakfast buffet is served every morning in the stone-paved breakfast room of Serie featuring white furnishings. The village of Koundouros and its beaches are 15 km away from the complex, while the beautiful beach of Pisses is even closer. In fact if you have a car this is one of the best places you could stay on the island since you can easily walk right into Ioulida for dinner at one of several very good restaurants and spend the day exploring the island. Wi-Fi access and private parking are offered free of charge. The Hotel Porto Kea Suites Matt's Pick! 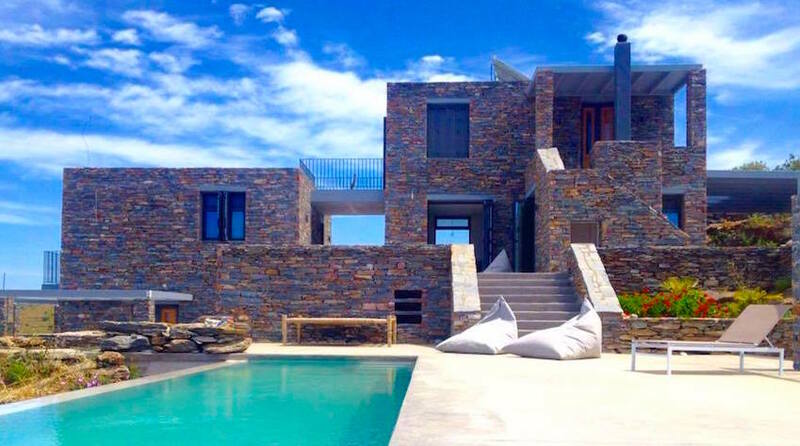 The Hotel Porto Kea Suites opened in the summer of 2005 and is in a category all its own when it comes to accommodation in Kea. Built in the style of the island, all suites have AC, DVD (There is a self-service DVD machine down the street), balcony with view of the bay of Korissia, kitchenette, mini-bar, and other amenities. The hotel is right on the beach but it also has a beautiful pool, lawn and garden area, a TV lounge for big games, room service, snack bar and plenty of parking so you can wake up in the morning and explore the island. It has its own gourmet restaurant and is a close walk to restaurants in the port, the beach of Galiaskari and the yacht harbor at Vourkari. 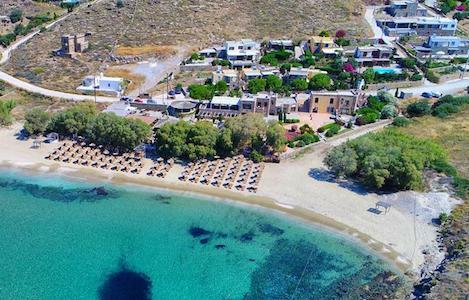 There is a very nice beach bar on the beach right in front of the hotel and the town has a small but well equipped gym with exercise equipment right on the beach so you can have a workout and then cool off in the Aegean. It also has free wi-fi. Cavo Perlevos Studios and Apartments: Matt's Pick! AGRIKEA is a contemporary, stone built, home-stay perched on a hillside with panoramic views of sunset, sea and the far lights of Athens. Like all beautiful things, it was created from a combination of ideas, fortunate co-incidences and hard work. Agrikea is ideally located to be both secluded and still relatively close to the social life of the island, the restaurants, cozy bars, nightclubs and cafes. It also provides easy access to both west and east facing beaches. The ethos of the home-stay as a natural refuge from city noise and stress means that it is more suited to adults. The winding, rural road to Agrikea, offers beautiful vistas and a connection to the geological processes, the farming culture and natural vegetation that makes Kea special. To drive the 4km, from the port is a short journey into another world, one which never loses its charm. Agrikea has 4 twin/double rooms (two of which have kitchenettes) and a suite for up to 3 people, all with sea and sunset view. Prices depend on the season and range from 80 euro to 180 euro per night per room. Breakfast may be served in the rooms, terraces or garden or all together under the pergola, as often happens (10 euro per person.) Agrikea offers free pick-up and drop-off at the ferry but because of its location you will need a car or a motorbike to explore the island. Agrikea does have free wi-fi too. Compared to similar properties on the island this one is a bargain and is usually booked solid so if you are interested, book now! 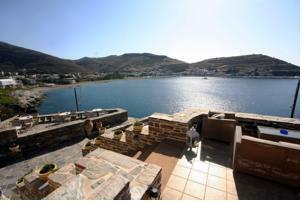 This is a special house with a spectacular view in the middle of the historic town of Ioulida, the capital of Kea. 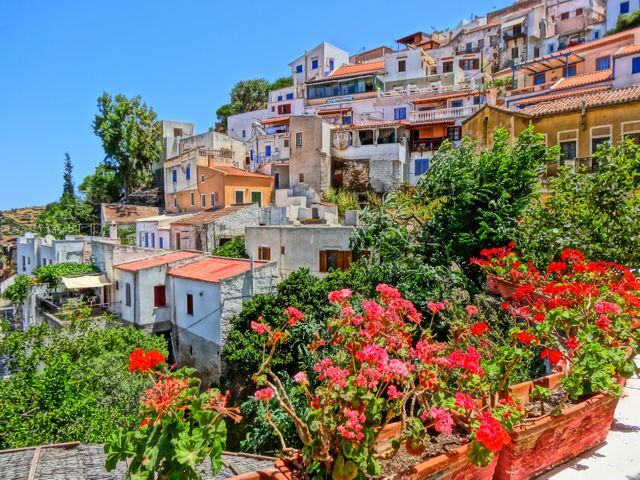 Owned by a Swiss writer and decorated in the traditional Greek style, the historic house which is built cave style into the mountainside, overlooks the main square and features a view of the Cavo d Oro with ships passing by continuously. You can actually see all the way to Athens on a clear day. 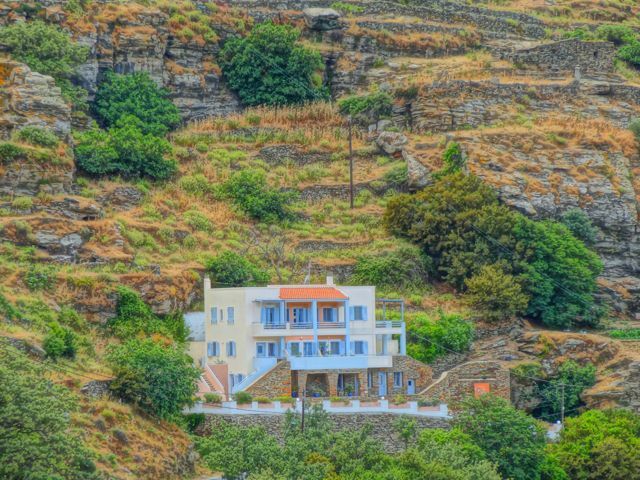 The house is ideal for a couple or a family on holiday and even better if you are a writer, artist or photographer like Peter Poulides who took the photos on the website when he came here with his family. The village is closed to automobile traffic so safe for children who only have to worry about donkeys. Besides the large balcony there is a shaded courtyard that is completely private. Of course there is a full kitchen sleeping rooms as well as sitting rooms where someone can sleep. Steps away from the famous Rolando's Cafe, one of the best fish restaurants in Greece and overlooking Yannis Taverna in the square, two places you will probably be spending a lot of time. You can also get free wireless internet from the town hall across the street. Just 200 metres from the beach of Otzias, Holiday Rooms offers self-catered accommodation with free Wi-fi throughout the property. 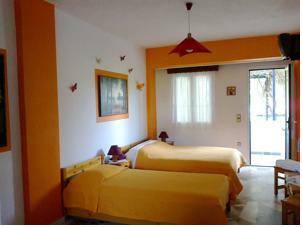 All the studios and apartments are fitted with a balcony that looks out to the lush garden and olive grove. The rooms and apartments include air conditioning, LCD satellite TV, kitchenette with kitchenware, fridge and microwave. Complimentary barbecue facilities can be found on site. Tavernas and a mini market are situated 200 metres away and in fact the family that owns the property also have the Otzias Taverna, one of the best restaurants on the island. Holiday Rooms is 2 km from Vourkari village and 6 km from the port of Kea. Free private parking is available on site. If you have children and plan to spend a lot of the time at the beach then Otzias is a good place to stay. For booking and more information and photos click here. 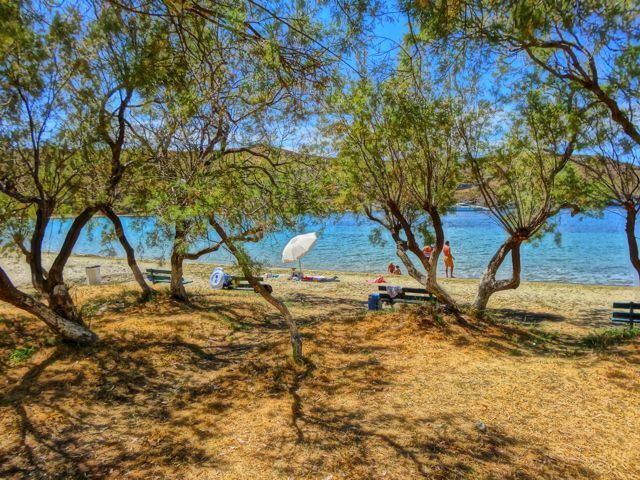 Located on the waterfront of Korissia in Kea, Hotel Karthea is a 2-minute walk from Agios Georgios Beach. 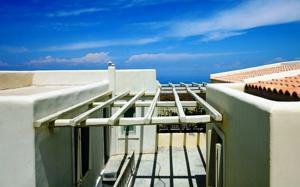 It features rooms with a private balcony overlooking the village or the Aegean Sea. Rooms at the Karthea are tastefully decorated with wooden furnishings and parquet floors. Each includes a fridge, a TV and free Wi-Fi. All units have a private bathroom with amenities and a hairdryer. Breakfast is served daily in the dining room or in the rooms. Guests can have drinks and coffee at the bar. The hotel also features a small library. 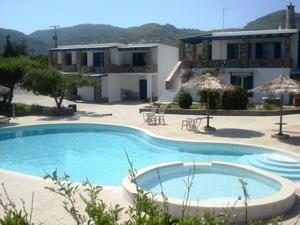 Korissia�s waterfront is lined with little caf�s and bars. Ioulida, the island�s capital is set on a hill 5.5 km away and if the bus is not running you can easily get there by taxi. Staff at the 24-hour front desk can arrange car rental which is essential if you want to explore the island. 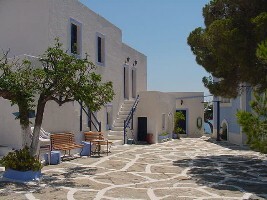 Cycladic-style guesthouse, located just 100 metres from Otzias Beach. Offering self-catering accommodation with free Wi-Fi, the property features a swimming pool with bar and free sunbeds amidst its lush gardens. The simply decorated studios and apartments open up to a furnished balcony with garden and pool views. Each includes a dining area and a fully equipped kitchen, giving you the opportunity to prepare your own meal. Staff at the 24-hour front desk provides car rental and tour desk services. Guests can freely use the BBQ facilities, while children can enjoy themselves at the children�s pool or at the on-site playground. 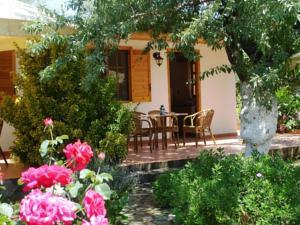 Anemousa Studios is situated 10 km from the capital of Kea and 6 km from Koryssia port. A mini market and restaurants can be found within 100 metres. Free private parking is possible on site and most likely you will want to rent a car. Forbooking and more information and photos click here. This hotel/apartment complex is located in Korissia, 200 metres from the sea and 400 metres from the port where most of the island's shops and restaurants are located. All rooms are serviced daily and have air conditioning, TV, kitchenette or refrigerator and balcony overlooking the valley. Ioulida, the capital of the island is just 6 km away. The hotel has a beautiful garden with colorful flowers and bougainvillea. You can walk to the port beach and the beach at Galiskari from here and also to the restaurants in the racht harbor of Vourkari. There are two supermarkets within 200 meters of the hotel for those who self-cater. 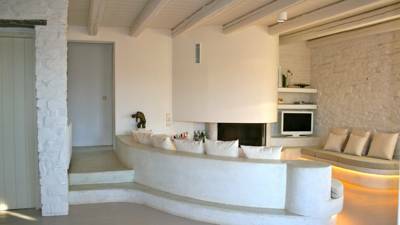 Situated at the top of Ioulida, Kea Villas offer a unique view of Kea�s main town and the Aegean Sea. Ok, you can't tell from the silly photo but these are very nice apartments and the only drawback is that they are at the top of the village and you will need a car. In fact you may even want a car to drive to the bottom of the village and walk to dinner so you won't have to climb all the way up after a big meal and a lot of wine. Built according to the Cycladic architectural style, the complex features self-contained private houses that share a swimming pool. The elegant villas are naturally aired, and feature ceiling fans. 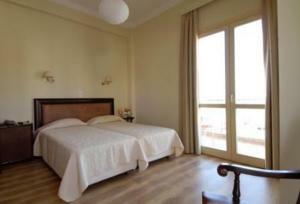 Both the livingroom and bedroom open onto large furnished verandas with Aegean Sea views. Wi-Fi is free, and villas come with an LCD TV and hi-fi system. Kea Villas include a modern fully equipped kitchen with built-in electrical appliances and all necessary equipment for at-home cooking. Local wine, traditional treats and bottled water await guests upon arrival. A 15-minute drive from the beach, Kea Villas is 5.5 km from the port of Korissia. Free mountain bikes are available, and parking on the premises is free. (You will need a car if you stay here). For booking and more information and photos click here. The House in the Port is a simple village vacation home, located in the harbor of Koriss�a. 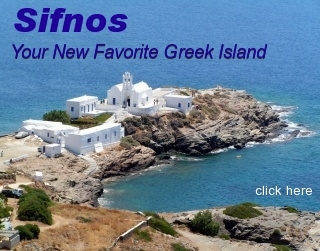 If you have ever wanted to live in a Greek village on the sea then this is the place for you. This property is less than a 1 minute walk from the beach and is even closer to the cafes, restaurant, shops and bakeries. Featuring a terrace, the vacation home features air conditioning and free WiFi. There is a sitting area, a dining area and a kitchen complete with a microwave and a toaster. 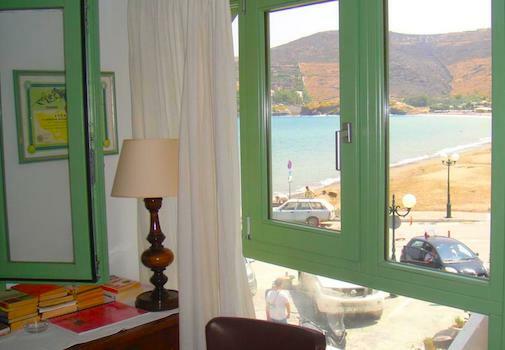 But the main selling point for this property is the fact that you are right in the center of all the activity, the comings and goings of the ferries, the villagers and guests taking their nightly walk in the harbor, the fishermen selling their fish in the morning and sailboats arriving in the evening. You are also about 50 steps from Rolando's Restaurant. For booking and more information and photos click here. The house is beautifully decorated with unique art pieces from Greek artists. All bedrooms are spacious, bright and minimal, offer every comfort and privacy to the guests and have full access to the outdoors. The wardrobes provide enough space for clothing as well as storage of suitcases and bags. All windows are equipped with pull-down insect screens. The Art House consists of two levels, each with its own entrance. As you enter from the main door on the ground floor there is a spacious open plan sitting room with a dining area for 6-8 persons. The sofas here are comfortable enough that can be used as beds in case of the occasional family�s extra guest. Attached to the living area is a fully equipped kitchen offers numerous possibilities for the guests that would prefer cooking on their own for their family or friends. There is also a guest WC with washing machine. One of the guest bedrooms is located on this floor and it features a dressing area and an en-suite bathroom with separate toilet (French style WC). There is a library with a collection of art literature. The room has access to a private shaded veranda for guests to enjoy their morning coffee. On this level there is one terrace in the back of the house, the perfect place when a strong wind "meltemi" is blowing and one in the front with outdoor dining facilities, panoramic sea view and a wooden pergola. A beautiful staircase from the main hall leads to the upstairs bedrooms. The upper level includes one double bedroom; one room with bunk beds for the kids; a sharing bathroom with shower. A small kitchenette also on this level allows guests to enjoy a quick coffee, snack or a cool drink. All the bedrooms have access to a panoramic sea view terrace. Around the house, there is plenty of outdoor space with pergolas to sit, read, paint, or simply relax and enjoy meals on warm summer evenings. Overlooking the Aegean Sea and Vourkari Port, modern stone-built Aigis Suites is situated on a hill. It features a seasonal outdoor infinity pool with a terrace, sun beds, umbrellas and unlimited views. These stylish and spacious suites offer free Wi-Fi, flat-screen satellite TV, DVD & CD player, minibar and furnished terraces. Featuring minimal d�cor, they are fitted with Coco-Mat pillows and mattresses. Some units have a private pool, an open shower and spa bath. An � la carte breakfast is prepared daily that includes homemade items and can be served in the privacy of your suite. The on-site restaurant offers Greek cuisine of local produce. The bar has a variety drinks and coffees that can be enjoyed by the pool. The facilities consist of a Shambhala spa, hot tub and steam bath. The hotel�s tour desk can provide information on various local attractions and excursions. Car rental is available upon request at an extra charge and unless you plan to sit at the hotel all day and admire the view or are rich enough to take taxis everywhere, you will need a car. Aigis Suites is situated just 2.5 km from Korisia port. Free private parking is available on site. 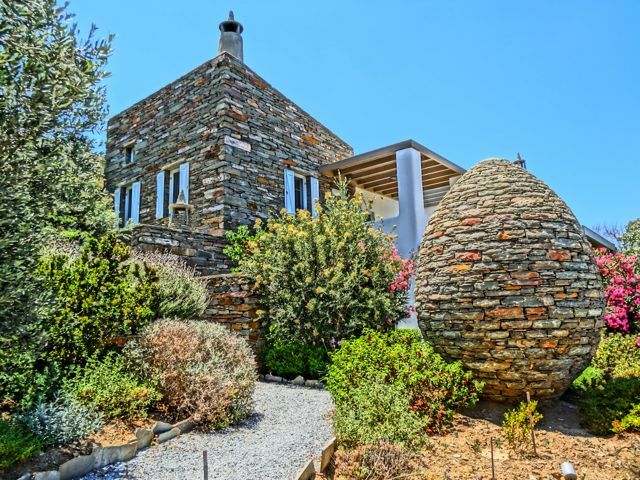 The stone-built Keos Katoikies is located 400 metres away from Korissia Beach and 700 metres from the port. It offers elegant accommodation with views over the well-kept gardens or the bay and has a sea-view cafe. Decorated with respect to the island�s style, Katoikies rooms feature soft colours and wooden-beamed ceilings. Opening out to balconies or verandas, they include a TV, mini fridge and air conditioning. Hairdryer is available upon request. Offering panoramic views over the bay of Agios Nikolaos, Keos Cafe serves buffet breakfast in the morning, as well as homemade deserts, cocktails and light snacks. Around the bend just 500 yards from the hotel is the beach of Gialiskari and there is excellent swimming on the flat rocks just below the hotel. It is an easy walk to the restaurants, cafes and bars of both Korissia and Vourkari. Free Wi-Fi and free private parking are provided. Just 150 metres from Korissia Beach in Kea, the family-run Koralli features a blossomed garden with bougainvilleas and various trees. It offers free Wi-Fi in all areas and rooms with a garden-view balcony. Fitted with marble floors and lively colours, the rooms of Koralli have a fridge and cooking stove. Each air-conditioned unit features a TV and a private bathroom with shower and a hairdryer. Guests will find restaurants, shops and bars within a short walk from Koralli in the port of Korissia which is just 400 meters away. You can also walk to Gialiskari Beach as well as the restaurants, bars and cafes in Vourkari. Free covered parking is available on site. Boasting an outdoor pool and a bar-restaurant with sea views, Anamar Kea is located in Koundouros, 50 m from the beach. It offers rooms and suites with free WiFi access and is 16 km from Ioulida Town. The rooms and suites at Anamar are equipped with a flat-screen TV and a bathroom with built-in rain shower, hairdryer and free toiletries. Some units have a seating area to relax in after a busy day. Views of the mountain, pool or garden are featured in certain rooms. There is a 24-hour front desk at the property, while car rental services can be provided upon request. (A car is recommended). Kea Port, connecting to Lavrio Port, is 23 km from Anamar Kea, while the lively Vourkari is at a distance of 26 km. 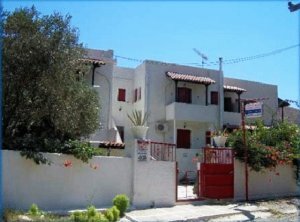 This property also has one of the top-rated locations in Koundouros on Booking.com and guests are happier about it compared to other properties in the area. This property is also rated for the best value in Koundouros! Green Island Resort is actually 3 five-bedroom villas and features a garden, year-round outdoor pool, and seasonal outdoor pool. Though their page on Booking.com say the property is in the village of Ioulida, it is not. It is in a settlment called Ag. Nikolaos and you will need a car if you stay here, to go to the beach, shop or go to tavernas. Free private parking is available on site. All units include a flat-screen TV. Some units have a sitting and/or dining area. There is also a kitchen, equipped with a dishwasher. An oven and microwave are also provided, as well as a coffee machine and a kettle. Towels and bed linen are featured. Green island resort kea also includes a barbecue. Every house has its own pool. Guests can enjoy a drink at the on-site bar. The property also has grocery deliveries. Eleftherios Venizelos Airport is 46.7 km away, and the property provides a free shuttle service. Couples on Booking.com in particular like the location � they rated it 9.2 for a two-person trip. This property is also rated for the best value in K�a! Not for everyone but the Kastriani Monastery rents rooms in one of the most spectacular settings on the island, high above the sea on a mountain. There is a small restaurant run by a woman named Maria. If you enjoy peace and solitude stay here. Call (22880) 24348 or 24324.